Too broke to go to Austin? Can’t get out of work? Hate dealing with traffic and large crowds? Maybe just too lazy to release yourself from the couch’s sweet sweet embrace? Have we got good news for you! 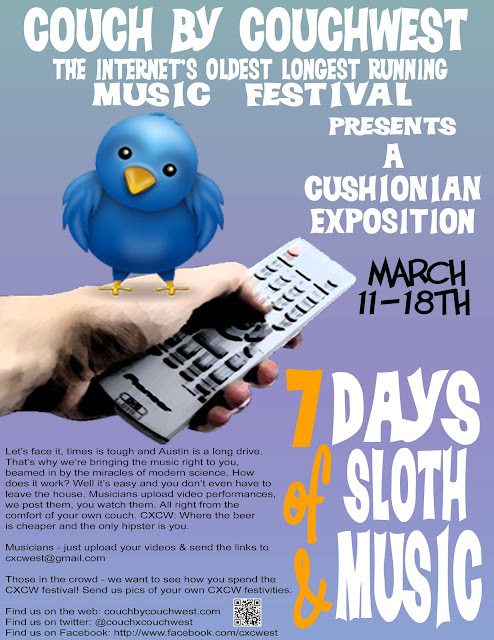 Couch By Couchwest is the online music festival that takes place the same week as that other (couch deficient) music festival you may have heard of, you know the one. Musicians: Please upload your unique to CXCW 2012 video (i.e. for the CXCW festival) to YouTube or Vimeo and send the link to us via the below form or to cxcwest at gmail dot com. Those in the crowd: we want to see how you spend the CXCW festival! Send us pics of your CXCW festivities, taco and nacho recipes, haikus, lazy dogs and cats, avant garde performance art, etc… via twitter, facebook or email (cxcwest at gmail dot com)! Adam Remnant of Southeast Engine from Athens, Ohio, performs the old-time song "Cripple Creek." 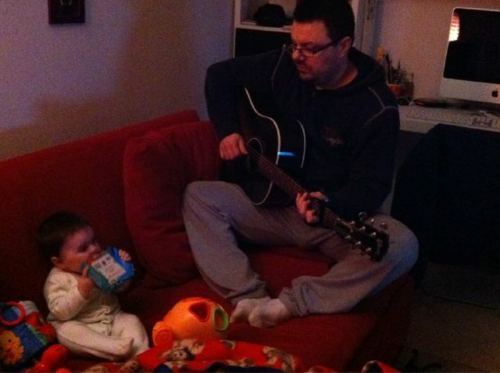 Max in Italy says: "joining the party from Italy #CXCW not #SXSW" Is there anything sweeter than singing to your baby? Unlike SXSW, children and pets are allowed at CXCW. Matt Woods of Knoxville, Tennessee, does an original song called "Deuces." Haley and friend from Denver,Colorado, doing some serious CXCW-ing. Poll: Who was hotter in 1969?